GREATER BOSTON, Mass., June 27, 2018 /PRNewswire/ -- 128 Plumbing, Heating, Cooling & Electric, a BBB A+ rated home service company with more than 1,000 five-star reviews online, has announced an expansion of its services with trenchless pipe relining. "Our Boston area neighbors put a great deal of pride into their properties, and excavating their yards to repair ruptured sewer lines is the last thing they want for their landscaping," said Ryan Williams, general manager of 128 Plumbing, Heating, Cooling & Electric. "Fortunately, there is an alternative to digging, and we're happy to offer trenchless pipe relining as a service that will save our customers time, money and lot of heartache." Saves Time – Before a technician can even begin a traditional line replacement, the task of trenching must be completed. Eliminating the process of trenching and excavation significantly reduces the time it takes to reach resolution for the homeowner. Excavation aside, the process itself is already more efficient than traditional replacement and can usually be completed within one day. Saves Money – Often, traditional excavations and trenching will extend well beyond the yard and require disruption of hardscapes. If the road is impacted, the homeowner is usually forced to pay the town or city for the inconvenience, including repairs and rerouting of traffic if necessary. This can result in costs of more than $10,000 depending on the extent of the project. By eliminating the need for excavation at all, homeowners save money on time clocked by professional technicians as well. The process is more efficient, and therefore much less expensive. Reinforces Older Pipes – Pipes, especially in older homes, may be made out of materials not meant to last more than 20 or 30 years. These pipes are susceptible to penetration by tree roots, and as they age will crack and separate allowing leaks into the soil. The new liners will last a minimum of 50 years and are much more resistant to environmental hazards. Preserves the Home – Trenching for a sewer line replacement can destroy a well-manicured lawn, including flower beds, sidewalks, mulching and more. All of these items, although outside the house, are a part of the home that the residents work so hard to maintain and is a major factor in curb appeal for those looking to sell their homes. Trenchless pipe relining grants a peace of mind to homeowners that the aesthetics of their space will not be ruined. 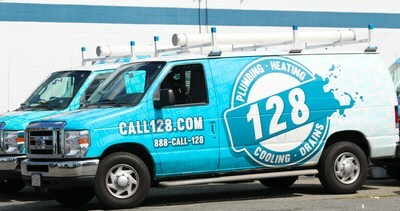 For more information about trenchless pipe relining services from 128 Plumbing, Heating, Cooling & Electric, please call 1-888-CALL-128, visit www.call128.com or watch their newest video on drain relining here. 128 Plumbing, Heating, Cooling & Electric, rated A+ by the Better Business Bureau, was founded in Wakefield, Massachusetts more than 25 years ago. Since their start, 128 PHCE has expanded and grown to become Eastern Massachusetts' most trusted and consistent plumber, heating and air conditioning service company with over 1,000 5-star reviews online. For more information, call 1-888-CALL-128 or visit www.call128.com.